The material graphene has many incredible properties, but to date it has been difficult to use on a large scale in industry, because it loses its unique properties and goes back to its origin graphite. Researcher Mamoun Taher has developed a new form of graphene that can solve the problem. 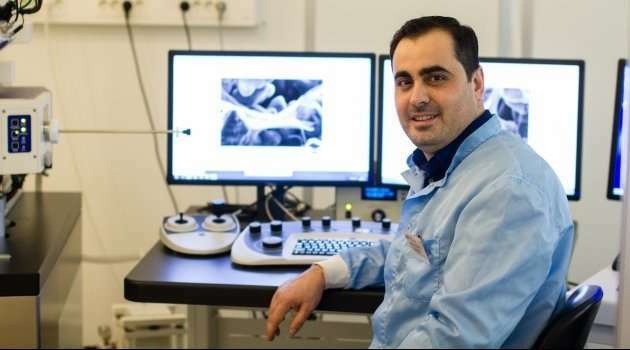 "The challenge has been to scale up graphene's outstanding properties from nanoscale at laboratories to macro-scale at industry without degradation," says Mamoun Taher. He is a researcher at the Department of Chemistry at Uppsala University and CEO of start-up company Graphmatech. The new material, Aros Graphene, has been designed to prevent this by incorporating designed molecules, so called "separators". "The separators are designed to separate graphene flakes without degrading their properties, so we have control over the material. The process has been designed to be environmentally accepted, we use water as a solvent and no hazardous chemicals." The development takes place in close partnership with the company ABB and they also have access to ABB's laboratories in Västerås. "I combined my previous research with my studies of graphene, and that's how Aros Graphene was born." "We've seen that a thermal paste that contains Aros Graphene is 180 percent more thermally conductive than other thermal paste products on the market. In the close future where more and more data centres will be needed to store data, there is huge demand for advanced thermal management solutions." GraphMaTech has several other projects, for example on self-lubricating mechanical systems, 3-D printing, moving electrical contacts and printed supercapacitors. "We aren't just developing a material, but also processes that can be used by graphene producers and other materials-related industries. We're currently in discussions about licensing our process," says Mamoun Taher.